Application template is a collection of predefined monitors to be created at once. Instances of such templates are called applications; each application has its own node in a main tree. Monitors from an application template perform in-depth checks for a particular type of host or application. For example, there are templates for a generic Windows Server, Microsoft Exchange Server, Apache and IIS web servers, Oracle database server and so on. Application templates are intended to help you creating and maintaining your monitoring system. 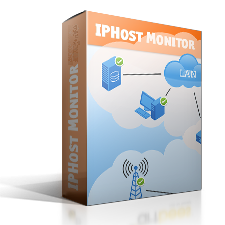 The IPHost Network Monitor installation contains over 50 standard (predefined) application templates and provides you with the tools to create your own templates. All the application templates that has been defined in the system configuration (standard, user-defined or community) can be reviewed and configured (if possible) in the Templates Dialog. You can find the detailed description of all the standard (predefined) application templates here. Also, you can download community templates from the Templates Community. Community templates are enabled by default. You can modify community settings in the Community Settings Page or in the Templates Dialog. An application template can be applied to the host manually via the New Monitor Wizard. See here for details. An application template can be used in a discovery process. The Discovery Wizard allows to select application templates to be searched for. Each application template contains a set of conditions that define how to process the application during discovery. If these conditions are satisfied the application template is applied to the host: a node is created in the main tree as a host child, and the template monitors are created and started. See here for details. An application template can contain attachments. Different kinds of files can be attached to application template, like SNMP MIBs, scripts et cetera. Those attachments can be referenced in monitor settings. Attachments can be placed in predefined standard directories or they can reference files in custom paths. Template attachments can be reviewed, edited or deleted in the Templates Dialog. Server Health Check contains templates that are configured to check an overall system health of a server: show CPU and memory usage stats, disk space usage, traffic data. Domain Controllers contains templates that are intended to check a domain controller state: show essential services, ports and system shares availability. 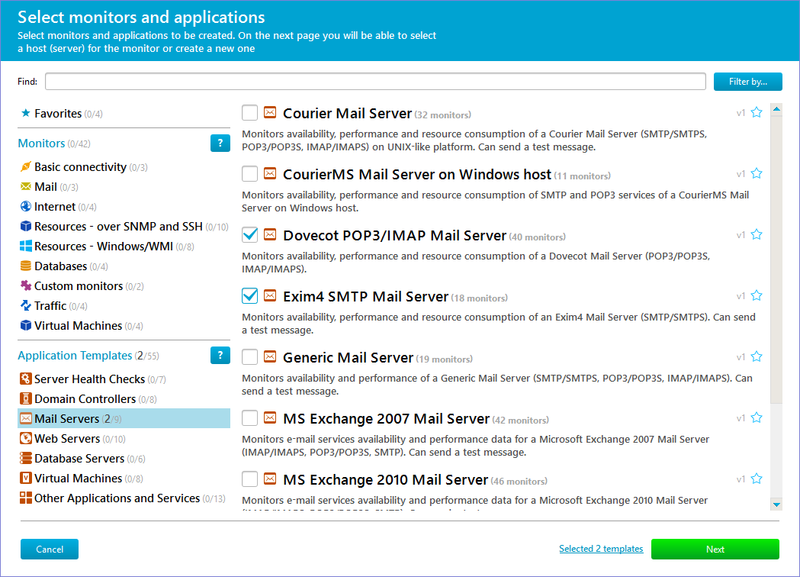 Mail Servers contains templates that allow to check detailed performance and availability of various mail servers: test the POP3/IMAP4/SMTP connection, check ports availability, send a test message. Web Servers contains templates that can check availability, performance and traffic data of an Apache or IIS Web server, or a generic Web server. Database Servers contains templates that can monitor various database servers: MSSQL, Oracle, MySQL. Virtual Machines contains templates that allow to monitor hypervisors and virtual machines, such as KVM, Hyper-V and VMware ESXi. Other Applications and Services contains templates that allow to monitor various applications and services that can’t be classified as one of the above. A user-defined template can be added into any category. Also, you can create a new category by editing the <Category> value in the template XML file before importing the template into the system configuration. See here for details. Template parameters: Name, Description, Discovery Settings. Match monitor description: a specific monitor that is used, by default, in the automatic network discovery to determine if the application can be applied to the host. Monitor descriptions: other monitor descriptions, such as name, type, monitor parameters and state conditions. Template attachments: files that can be created on file system when template is added, and then those files can be referenced in monitor settings. For security reasons a template monitor description does not contain user credentials even if they are specified for the monitor used to create the template. The application (a template applied to a host) inherits its credentials from its parent host (as any other tree node can do). And all the application monitors inherit the credentials from their parent application. A template monitor description does not contain alerting rules. The application monitor inherits its alerting rules from its parent application, which in turn, inherits them from the parent host. For other monitor parameters and state conditions the following default rule is in use: if a template monitor description contains a parameter definition, this definition is used when the monitor is created. If not, the inherited parameter or state condition is used. You can review and edit (if possible) a template in the Templates Dialog. Each application template can contain a set of files. These attached files will be created on file system when template is added and then can be referenced in monitor settings. For example, one can use attachment as script or pass it as argument to some script. You can modify all these conditions for a user-defined or community application template or some these conditions for a standard application template using the Templates Dialog. There are several ways to create a new template. You can export an existing one using the Templates Dialog Export button, modify the XML file, and import the modified XML file as a new template. Also, you can create a template from the existing monitors: select the monitors and use the Create template… context menu item. In the “Create template” dialog you can either save a new template as an XML file for future editing and importing, or save it as an XML file and add to the system configuration immediately. You can apply a template to a host manually using the New Monitor Wizard. On the first page you can select a template category on the left pane and check application template(s) on the right pane of the page. 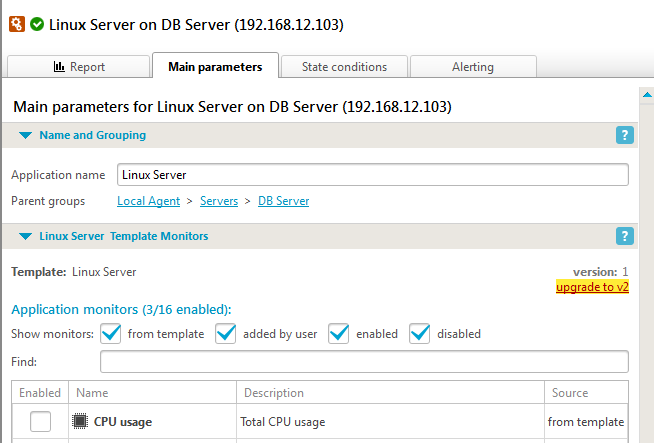 The next pages allow you to configure the application: enable, disable and configure the application monitors. On the sample below two templates are selected in the Mail Servers category on the New Monitor Wizard first page. You can find a detailed description of how to apply an application template to a host via the New Monitor Wizard here. 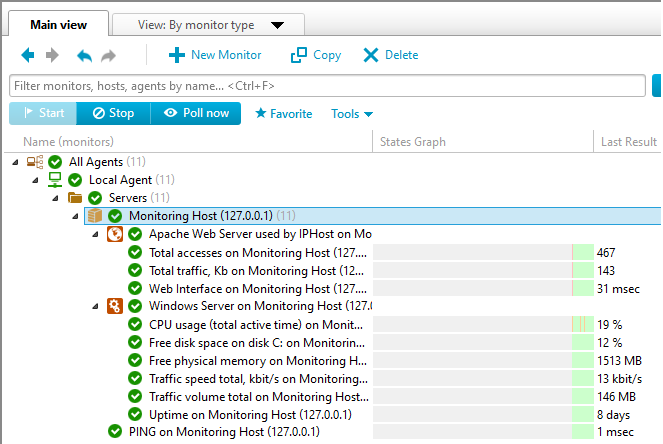 Apache Web Server used by IPHost – Monitors from this application template check performance and traffic data of an Apache 2.X Web Server used by IPHost Web Interface. Uses HTTP/HTTPS monitors to check Web interface availability. Windows Server – Monitors from this application template check traffic speed and volume, performance data, and overall services status of a Microsoft Windows Server. The monitors collect data over WMI. The Advanced Network Discovery Wizard allows you to select the application templates that it will try to find during discovery. The discovery process will apply a selected template to the host in accordance with the template Discovery Settings. If an application monitor has not been detected during discovery, and Discovery Settings require it to be created, the monitor will be created in Stopped state. To fasten the discovery process, only few monitors are enabled in a standard template by default. 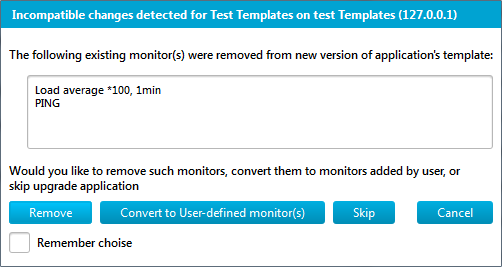 You can enable or disable the application monitors using the Template Monitors section on the application Main tab after the discovery process is finished. When an application is upgraded the following can be changed: the monitors list, the monitors settings and state conditions. If a monitor settings or state conditions have been changed by the user they will not change during upgrade. If the template new version contains new monitors they will be added to the application, in off state. If the template new version does not contain a monitor from the current version, the template is considered as conflict. If a monitor that cause the conflict is off in the current version of the template it will be deleted during upgrade automatically. If a monitor that cause the conflict is turned on, a dialog window to resolve the conflict will start. You can upgrade several applications using the Upgrade Application link on Templates Dialog.